This is Dave. He’s Superman’s youngest brother. He comes into my kitchen like this from time to time and shows me a thing or two about finding my way around. My culinary skills can be described as thus: late-blooming, learned from television, rather routine but with brief flashes of delicious. I can make a normal dinner for my family that my kids seem to think is edible, but I make the same things over and over, and did for a good seven years when I was a SAHM. My kids had almost memorized my rotation: spaghetti, potato soup, beef au jour, tuna melts, ravioli with chopped tomatoes and basil, and mastociolli. Those were my basics. Now that I’m a working gal again, Superman has taken on the cooking. Mostly because he’s home before I am, so it makes more sense to have him start things simmering. Superman is actually a very good cook. His salsa is brilliant. And he also makes us pancakes, breakfast burritos on Sundays, the most amazing enchiladas ev-ah that he learned from his dad, and hamburgers that could be served in restaurants. He also grills. And he makes a delicious Spanish soup (at least that’s what I call it, because it has lots of cilantro, some kind of hot pepper, chicken with a good spicy finish, and is topped with cheese/tortilla strips/onions). Anyway, that’s how we cook. We both have our “routine” dinner fare, plus we have our brief flashes of gourmet. 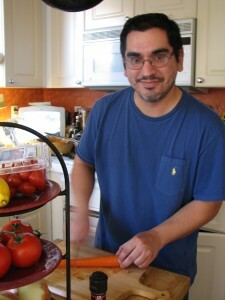 So Dave, Superman’s brother, visits from time to time from Te-jas and gets in my kitchen and makes things smell amazing. He is a GREAT cook. And my kids appreciate his talents – they’re pretty open and adventurous eaters – so he likes cooking for them. He makes an amazing chicken-and-smoked-sausage gumbo that we request over and over again (pretty much every time he comes out). He made an excellent Americanized goulash last time he was here, which he served with braised carrots and pierogis. And he makes a delicious French chicken dish called poulet chasseur that he renamed “Poulet Nene” after my daughter Rene (who loves it). He’s even got my kids in the kitchen, learning to pull chicken or chop onions. This entry was posted in Our Humble Abode, Recipes in our Kitchen by Lauren Christopher. Bookmark the permalink. Laurie, you are an excellent cook! I always loved-and still love- your cooking. I wish you would get home before me because I love when you make us our dinners! I can smell the food now! Go Longhorns! Texas fight, Texas fight, yay Texas fight! Hook ’em Horns! OK, just had to get that out of the way. First off, let me comment on how handsome your brother-in-law is. I’m sure he is quite the charming guy too. Thanks for the kind words. Do you know what’s better than cooking good food? Cooking it for people you care about. I love cooking for all my nephews and my niece, as well as my brothers and my sisters-in-law. I’ve got some new dishes all planned out to make for you all like tortilla soup, pork loin with mushroom gravy, beef short ribs stroganoff, fettuccine carbonara and chicken paillard with basquaise sauce to name a few. But, first thing’s first: Super Bowl Gumbo! Hi, Lauran — I think Chris did grill for us once, didn’t he? Hamburgers? (Or am I imagining that? Maybe we talked about it, but he never did? hmmm …. Old age is a funny thing. …) Anyway, yeah, I might have to beg them both to do some of their best dishes. Chris — Thanks, hon! 🙂 I do miss some of those evenings that were relaxing, simmering something that smelled good, waiting for everyone to run in from their day. … It’s much harder to cook after work, I gotta give you that. Dave we all totally appreciate your awesome kitchen skills! Can’t wait for your company and your talents…but mostly your company! Laurie thank you for recognizing! I think Dave needs to come East and spend some time showing off his culinary skills! My culinary skills can be described as thus: disastrous with brief flashes of delicious.